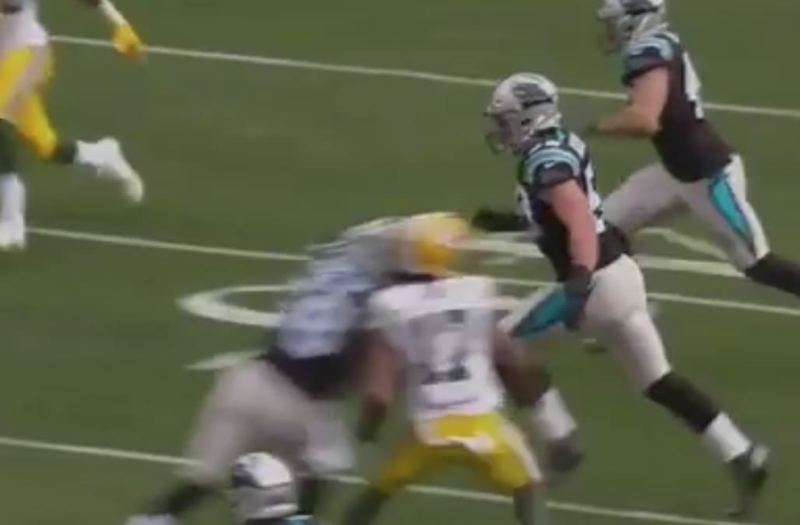 Carolina Panthers linebacker Thomas Davis landed a head shot on Green Bay Packers wide receiver Davante Adams. Adams walked off the field on his own but was taken back into the locker room to be checked. Earlier this season, Adams received a scary hit to the head by a Chicago Bears player and suffered a concussion. Green Bay Packers wide receiver Davante Adams was taken out of the game on Sunday after a scary and ugly hit from Carolina Panthers linebacker Thomas Davis. After Aaron Rodgers threw an interception in the middle of the field in the third quarter, Davis tried blocking for teammate Colin Jones who was returning the ball. Davis hit Adams head-to-head while blocking, sending Adams to the ground. The hit was extra scary as Adams has already suffered a concussion this season, after being hit by Chicago Bears linebacker Danny Trevathan in September. Adams didn't miss any time, but was taken off the field in a stretcher. Davis was visibly upset later, sitting on the bench with his head in his hands. Adams was luckily able to walk off the field on his own but was taken back to the look room by a team physician. As many noted afterward, the NFL suspended Pittsburgh Steelers wide receiver Juju Smith-Schuster after a similar hit on the Cincinnati Bengals' Vontaze Brufict. Though Smith-Schuster didn't help appearances by standing over Burfict and taunting, the two hits were similar.